For companies that sell products, this is generally an easy task. New products are available and updates to the company’s website are constant. The social media advertising of those campaigns can grab a customer into the site which then needs to hook the sale. Service companies are a little different. Most of their services don’t change a great deal from month to month. They may offer discount programs during the course of the year. Or promote certain services during winter months vs. summer months. But let’s face it, services can be a little harder to market than that new shiny electronic toy or a set of dishes. But again, that’s not enough if you don’t gain insight into what your visitors are interested in and how that social media marketing is working for you. No matter what the size of your company, at a minimum, you should be making a monthly review of your efforts. For larger companies this may need to be done weekly or even daily if you’re big enough. This is called Internet or Web Analytics. To be honest, the governing bodies who define these things for the Information Technology (IT) industry can’t agree on a definition of what Web Analytics really is. I’ve been working in IT for over 30-years and there’s always someone who wants to define an IT process this way, while everyone else wants to define it that way. But Analytics has been around in one form or another since the late 1990s, so this is nothing new. Basically, Web Analytics is a process of reviewing the effectiveness of your online marketing efforts. How many hits does your site achieve, how many of those are from unique visitors to your site, what posts or product campaigns are more popular than others. Where do your visitors come from to your site, knowing the Referrers help you pinpoint your marketing efforts on social media or other industry sites. Knowing this information and being able to review the data can give any person or company information for how to target their online marketing and take advantage of customer interests. Reviewing site traffic and analyzing data isn’t a hard thing to do and it can be beneficial for everyone. But it’s especially important for businesses of any size. You want to build your brand, get your company name out in the general public and in front of potential customers. Knowing what’s popular helps you offer more of the same or give you insight about what you may need to put more attention to that isn’t getting the attention you desire. For instance, if you’re a services company and you write an expert post that blows up the internet, you may want to offer more of that same type of information again to attract new customers. Even customers who don’t even know they’re customers may find their way to your business because they’re looking for something and your article came up in a search result. A Fire Prevention Sprinkler company might write an article about How A Fire Sprinkler Works to put out a fire. That could have general interest to builders, architects, engineers and engineering students and so on. To get that information out to a wider audience, that same sprinkler company can write that article with a universal interest; Fire Protection Sprinkler Systems – Do Fire Sprinklers Really Work Like They Do In The Movies? Send out that line on Twitter and you’ve opened the door to nearly everyone on the planet who’s seen someone in a movie hold a lighter up to a sprinkler that sets off every head on the office floor. Now you’re reaching people who may not need you today, but next week or next month when a movie goer is in the planning stages for opening their new carpet business down the street, they’re going to remember reading your article and that might bring them to you for servicing their new business. Most web-hosts and blog service providers include some form of site tracking that’s sufficient for any endeavor. But larger companies and corporations may need to look into commercial products that can handle larger volumes of traffic and more detailed information, break down of data and a whole boat load of other things. But there are some basics. 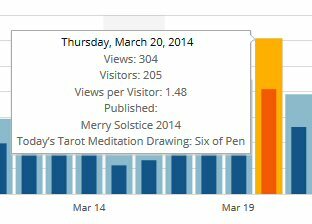 For instance, on my blog Springwolf Reflections I can view the daily statistics through out the day to see how things are going. So here’s the month of March. I can see which days brought in unique visitors and how many items they viewed. You always want that light blue column to be significantly higher than the dark blue line. In the chart below, you may notice some deep valleys in the visitations. You can tell here, but when I mouse over those columns I can see that those days are weekends. I don’t post very much on the weekends, so this isn’t surprising to me. In my business, this isn’t unexpected so I’m not worried about it. What about that spike on March 20th, what happened on that day that brought in more people to my author’s blog? My blog runs on WordPress and these statistics are part of their Jetpack plug in. But most of these types of statistical metrics are similar from company to company. So if you have a spike like i did on March 20th, you can usually move your mouse over that column to find out why. What was on your site that increased the popularity. For me, it was the Spring Solstice. Holidays always see increased traffic. But you should see what happens every time Friday the 13th comes around. But this gives me insight into what opens my site to a larger audience. 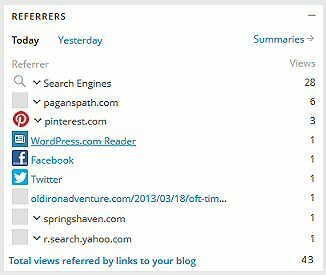 What can I do on the other days when traffic and views aren’t as popular to pull people into my blog and spend more time looking around and finding out what else I have available? That’s when you need to look at the additional metrics that are captured by your site statistics. If your site has international appeal, you may want to focus your attention on certain information or offerings. Knowing where you’re popular might help you target marketing to that region, or develop programs or sales events for those specific areas. Maybe it inspires you to find a plugin that translates your articles and posts into another language that targets a country where your gaining followers. Besides, it’s pretty kewl to see all the places where people are coming from to see your site. On the other side you can see more of the dynamics of what brought visitors to your site. What was the most popular article, what else might have been seen and is there a pattern to watch that can help you target more of the same type of information, or additional products or services. See that first item with 1 view for the day. Yep, even thought it wasn’t Friday the 13th, that post still comes up at least once or twice a week. Kinda proud of that one. Over the years I’ve been able to track what articles on my author’s blog are the most popular over all. 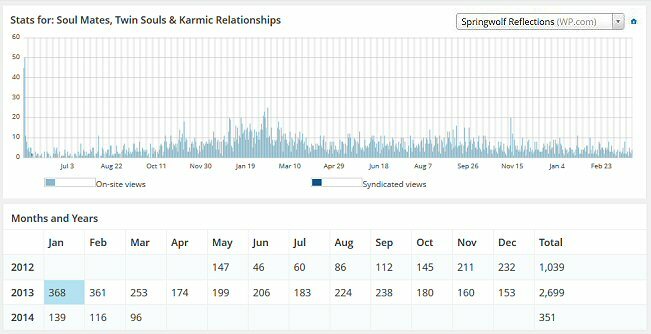 Soul Mates and Karmic Relationships is by far the most viewed post and always pulls people into the site each and every day. The Jetpack Statistics allow me to drill down even further and look at information captured for specific posts. So if I were to click on the magnifying glass next to that particular article, I can see more detailed data. Knowing this might help me to promote this article on days I have special news to share. I might update something in this article that will link to something new I’ve added. 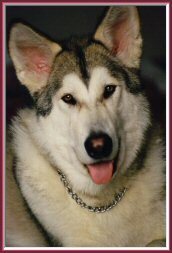 Or perhaps I’ll add an advertisement on this page that will highlight the a new product, service or event that is related to the topic of this article. This information is good to know if you’re selling products. If you have a particular item that pulls people into your online store, you might want to tag your new merchandise to that popular item so when people to view one, they’re drawn to the other. Or maybe you want to highlight a sale or special offering on a service. The more you know about what is and isn’t popular on your website, no matter what the genre, the more you can use what you have to your advantage to increase traffic. Thanks to the internet, the world has become a little smaller for doing business. We’re able to connect to more people in more areas than ever before. Even if you reach people out side your service area, those connections can help you build your brand, strengthen your reputation and show case your business for projects those people may become involved with where you do work. Put in a little effort each month for your online presence, review your analytics and see how much it benefits your company and your brand. Consider all the free advertising you have at your fingertips and look into the many ways you can connect to business partners and customers through social media. Between these two efforts, you can target your business, market your services and grow your company.